Special Meditation lead by Patricia Anne Davis, Navajo Medicine Woman, advocate of win-win decision making for Abundant Living! She will lead us in Remembering and Reawakening to our sacred self in our sacred place in the universe. From this sacred place we can put Love and Peace into immediate action. Please bring an image of what you love most in this world and add to our momentary collage/alter as we stand together envisioning a world of abundance, joy and peace. 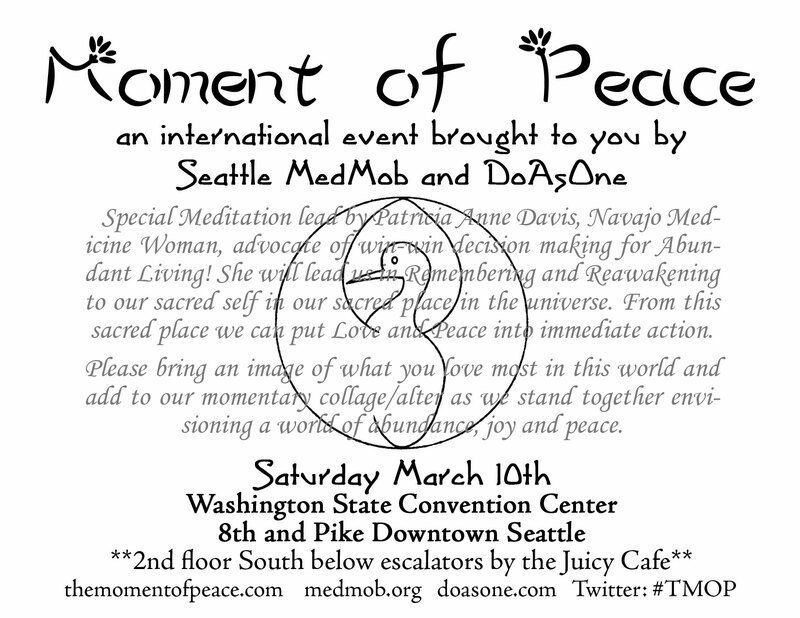 This entry was posted in Events, Native American Concepts and tagged chocktaw-Navajo/Chahta-Dineh, co-creative solutions, indigenous wisdom, native american concepts, native american wisdom, Patricia Anne Davis, Seattle, The Moment of Peace Meditation by Karah. Bookmark the permalink.